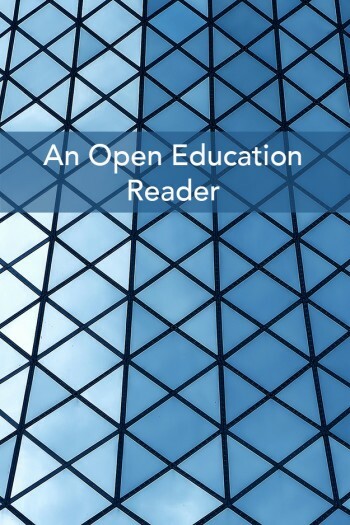 Book Description: A collection of readings on open education with commentary. Created for IPT 515R Introduction to Open Education, a graduate course at Brigham Young University. An Open Education Reader is published under the Creative Commons Attribution 4.0 License. This group of readings was compiled by David Wiley for IPT 515R, Introduction to Open Education, taught at Brigham Young University in Fall 2014. The students in the course, who are listed as contributing authors below, wrote the summaries and discussion questions for each reading included in the book. This is by no means a complete or final version of this book. We’re sharing it with the community now in the spirit of “release early, release often,” trusting that the community will help correct faults rather than criticize errors. Please leave suggestions for improvement in the comments at the bottom of individual pages, or email them to david.wiley@gmail.com. Cover photo by Shahadat Hossain, licensed CC BY. An Open Education Reader is licensed under a Creative Commons Attribution 4.0 License.